The jukebox has a long and proud history, and nowhere has this been more celebrated than in the Wurlitzer ‘1900 Centennial’ model, first produced in 1956. So it’s an obvious choice for a vintage re-issue: those with long memories will appreciate the nostalgic flush associated with the product, while lovers of retro design and jukebox fanatics will be wowed by its hefty cultural credentials. 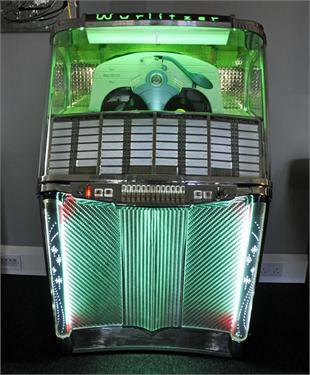 With such pedigree, it perhaps shouldn’t come as a surprise that Home Leisure Direct have slapped this jukebox with a £7,997 price-tag – an amount so staggeringly vast it surely requires some justification. Luckily, the company are willing to offer this in spades. The primary reason for purchasing a 1900 Centennial is doubtless a love of the old, retro and vintage. To that end, the 2013 re-issue has been restored using only original components: a canny move which suggests the company know their audience. By taking an approach to rebuilding that more resembles art-restoration than anything else, they give an added sense of pedigree to the finished product, while ensuring the 1900 has a ring of authenticity purchasers will undoubtedly love. It’s an intelligent marketing tactic and one guaranteed to play well with consumers. Stepping away from the restoration to focus on practical issues, the 1900 Centennial is capable of holding 200 selections, though its play choice is limited exclusively to 7” records at 45 RPM. Luckily, the vinyl industry confounded expectations by not collapsing when the CD appeared on the scene, so those lacking a previous record collection won’t find it difficult to amass a new one – although it may require some extra outlay. Obviously, in a world of iPods and phones capable of holding thousands of songs, a mere 200 A-Sides might seem like a limited choice, but choice isn’t what’s on sale here. What the company are offering instead is a fragment of our cultural past – a glorious slice of retro music history to furnish the living rooms of discerning consumers. Any actual functional ability is almost an unexpected bonus. Visually, the 1900 Centennial offers everything you’d expect from it. Although care has been made to restore it to an approximate original condition, with the chrome buffed to gleaming; small scratches on the glassware still persist. In this case, however, it’s due to the use of original glass – so to complain seems both churlish and to entirely miss the point. Sadly (or perhaps not, depending on your point of view) the coin mechanism has been thoroughly deactivated and the jukebox set to ‘freeplay’. However the company notes aspiring mechanics out there may well be able to get it working again – although we suspect that may invalidate the warranty. Regardless, the 1900 Centennial is handsome, pleasingly rough around the edges, and so utterly retro you could be forgiven for thinking you were standing in the 1950s. Moving on to the extras: the company are offering free delivery to the UK mainland, provided you live within 150 miles of their Bristol showroom. Since most of the North, the whole of Scotland and even parts of the South West fall outside this catchment area, it would be more honest to say they deliver free to London, the Midlands and Wales, with everyone else expected to pay for delivery. However, if you’ve already shelled out nearly £8,000 for a jukebox, an extra £100 or so for delivery is unlikely to phase you – and the 30 day free warranty is unaffected by distance. Due to the complicated nature of jukeboxes, the company advise you to install the product only in warm, dry areas – so basement rooms or converted sheds will have to be waterproofed beforehand. Nonetheless, for a chance to own a genuine slice of 1950s music history, we humbly suggest that it’s probably worth it, provided you have the sort of income that can afford it in the first place. Adam works with Home Leisure Direct, the UK’s premier games room specialist. In April 2013 we were chosen as the Reader’s Choice at the ECMOD Direct Commerce Award.